President Donald Trump said Wednesday that the U.S. wanted Turkey to turn over any audio or video recording it had of Khashoggi's alleged killing "if it exists"
Turkish crime-scene investigators searched the home of the Saudi consul general in Istanbul on Wednesday in the disappearance of Saudi writer Jamal Khashoggi, and a pro-government newspaper published a gruesome account of the journalist's alleged slaying. As Saudi Arabia's green national flag flapped overhead, forensics teams entered the residence, only 2 kilometers (1.2 miles) from the consulate where Khashoggi vanished Oct. 2 while trying to pick up paperwork to get married. It was the second-such extraordinary search of land considered under international law to be sovereign Saudi soil after investigators spent hours in the consulate earlier this week. The account published in the Yeni Safak newspaper alleged that Saudi officials cut off Khashoggi's fingers and then decapitated him at the consulate as his fiancée waited outside. The searches and the leaks in Turkish media have ensured the world's attention remains focused on what happened to Khashoggi, a Washington Post columnist who went into a self-imposed exile in the U.S. over the rise of Saudi Crown Prince Mohammed bin Salman. It also put further strains on the relationship between the kingdom, the world's largest oil exporter, and its main security guarantor, the United States, as tensions with Iran and elsewhere in the Middle East remain high. President Donald Trump, who initially came out hard on the Saudis over the disappearance but since has backed off, said Wednesday that the U.S. wanted Turkey to turn over any audio or video recording it had of Khashoggi's alleged killing "if it exists." Flying back home after a visit to both Saudi Arabia and Turkey, U.S. Secretary of State Mike Pompeo remained positive about an ongoing Saudi probe into Khashoggi's disappearance, but he stressed that answers are needed. Also Wednesday, The Washington Post published what it described as Khashoggi's final column. "The Arab world is facing its own version of an Iron Curtain, imposed not by external actors but through domestic forces vying for power." he wrote. The search of the consul's residence came 15 days after Khashoggi's disappearance — and after police apparently thought they would be able to conduct the search on Tuesday. Turkish Foreign Minister Mevlut Cavusoglu said Saudi officials had halted the earlier search, claiming that Consul General Mohammed al-Otaibi's family was still there. Crime-scene technicians wore white coveralls, gloves and shoe covers entering the residence. It wasn't immediately clear what investigators hoped to find there, although surveillance footage showed diplomatic cars moving between the consulate and the residence nearly two hours after Khashoggi walked into the diplomatic post. Turkey's private DHA news agency, without citing a source, said police wanted to inspect a "water well" in the garden of the residence. A high-level Turkish official previously told The Associated Press that police found "certain evidence" of Khashoggi's slaying at the consulate, without elaborating. The official spoke on condition of anonymity because the investigation was ongoing. The report by the newspaper Yeni Safak cited what it described as an audio recording of Khashoggi's slaying. 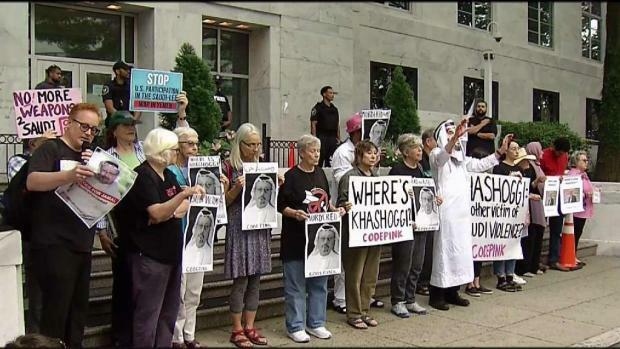 It described the recording as offering evidence that a Saudi team immediately accosted the 60-year-old journalist after he entered the consulate. Al-Otaibi could be heard on the tape, telling those allegedly torturing Khashoggi: "Do this outside; you're going to get me in trouble," the newspaper reported. One of the Saudis reportedly replied: "Shut up if you want to live when you return to (Saudi) Arabia." Saudi officials have not responded to repeated requests for comment from the AP in recent days, including Wednesday. Al-Otaibi left Turkey on Tuesday, Turkish state media reported. Pompeo, wrapping up a trip to Saudi Arabia and Turkey to discuss the crisis over the missing journalist, made a point to stress areas where the kingdom and America cooperate. "We have lots of important relationships — financial relationships between U.S. and Saudi companies, governmental relationships, ... the efforts to reduce the risk to the United States of America from the world's largest state sponsor of terror, Iran," he said. "We just need to make sure that we are mindful of that when we approach decisions that the United States government will take when we learn all the facts associated with whatever may have taken place." However, Pompeo said there were clear lines that America would not stand to see crossed. "If a country engages in activity that is unlawful it's unacceptable," he said. "No one is going to defend activity of that nature. We just need to simply say what happened." Prominent U.S. newspapers have reported, citing anonymous sources, that Saudi officials may soon acknowledge Khashoggi's slaying at the consulate but blame it on a botched intelligence operation. That could, like Trump's softening comments, seek to give the kingdom a way out of the global firestorm of criticism over Khashoggi's fate. However, no major decisions in Saudi Arabia are made outside of the ultraconservative kingdom's ruling Al Saud family. Associated Press writers Matthew Lee and Zeke Miller contributed.